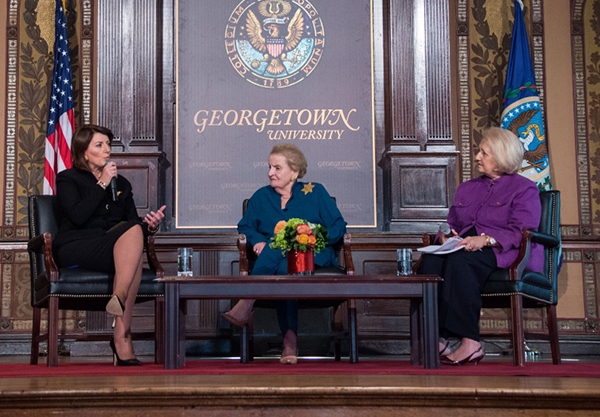 President of Kosovo Atifete Jahjaga and former U.S. Secretary of State Madeleine Albright spoke Sept. 30 in Gaston Hall on the involvement of women in peace processes. Ambassador Melanne Verveer, who serves as the executive director of the Georgetown Institute for Women, Peace and Security, mediated the symposium, and the discussion was followed by brief question and answer sessions with students. The event coincided with the release of the Georgetown Institute for Women, Peace and Security’s report on women’s political participation in peace processes in Northern Ireland, Guatemala, Kenya, and the Philippines. It also included remarks by an expert panel composed of Dr. Monica McWilliams of Ireland, Dr. Claudia Paz y Paz of Guatemala, Njeri Kaberi of Kenya, and Professor Miriam Coronel Ferrer of the Philippines. Called a “force for women’s political participation around the world” by Verveer, Jahjaga began her remarks by providing context of Kosovo and the roles women played in the reconciliation of post-war Kosovo. According to Jahjaga, Kosovar women mobilized and fought against the many human rights violations occurring across the nation during the 1990s. This included providing medical assistance and supplies to victims, marching from the capital to bring food to villages under siege, and compiling evidence to show to the international community of the crimes against humanity that were occurring daily in Kosovo. Jahjaga emphasized mobilizing helped the women succeed in spreading their message of peace and to gain access to the official decision making process. Secretary Albright, who assisted in bringing an end to the conflict in Kosovo on behalf of the United States, agreed with Jahjaga on women being the backbone of the country during and after the war. “Women wanted to become agents of change rather than victims,” Albright said. She then emphasized the capabilities of women to look to the future to improve society. Albright championed female participation in politics in the discussion. When asked how to involve more women in decision-making, Albright suggested making education about public service more available to women and strengthening the support system for female civil service workers.